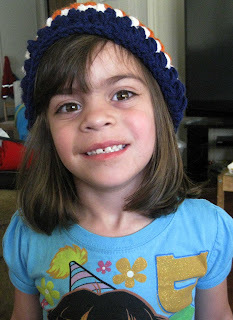 Gracie wanted a Bears Beanie, too, so I set out to find a pattern for her. As I was going through my yarn, I came across a puff stitch beanie pattern on my Impeccable yarn from Michael's Loops and Threads line. 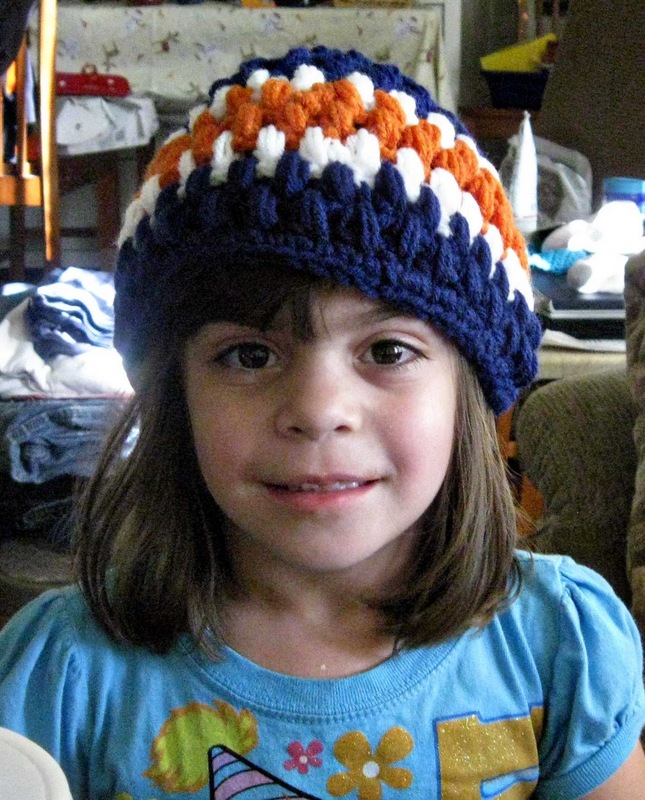 It claimed it was a for a small girl's head, so I decided to make it and see how it came out. It was super easy to make. The puff stitches went quickly and changing colors was not a problem. It has a very different look from Luke's hat so they can tell the difference easily. The sizing is too big for Gracie's peanut head, though. It isn't kidding when it says it is for a size 6-8 child. I followed their pattern creating 5 rows of navy blue puff stitches, 1 row of white, 2 rows of orange, 1 row of white, 2 rows of navy blue, finishing with a row of single crochets for the brim. Like I said, it's pretty big, but it will last for a while. Ever see something and think: I can make that?